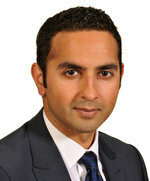 Adnan Sharif qualified from the University of Edinburgh Medical School in 2002. He completed his medical training in Edinburgh and Cardiff, before undertaking an MD in the field of Renal Transplantation in Cardiff. He completed his Nephrology specialist registrar training in the West Midlands and was appointed Consultant Nephrologist at the Queen Elizabeth Hospital in Birmingham, with a special interest in Renal Transplantation, in 2011. His training included a period of study at Johns Hopkins Hospital in Baltimore, United States, which has expertise in altruistic donor chain transplantation. He is also a member of Doctors Against Forced Organ Harvesting (DAFOH) and the National BAME Transplantation Alliance (NBTA), an umbrella group with the remit to boost organ donation among minority ethnic groups in the United Kingdom.